Podcast transcripts are written versions of the monologue or conversation published in audio format. A transcript is intended as a faithful record of what was discussed, but in my opinion, it doesn’t need to be verbatim, and when it is, it’s harder for readers to follow. 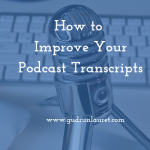 Some people prefer to read their content, or are unable to listen to podcasts as often as they’d like, so having a podcast transcript is essential if you want to please all sections of your audience. They should convey the same value as the audio version. I’ve written before about why you should have good quality transcripts, ideally done by a native English speaker. 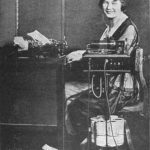 If you decide to do your own transcription, or use someone else but want to edit their work, the following tips should help. The first listen is when you’re actually creating the podcast transcripts, and are writing what you hear. 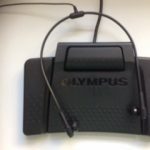 If you use transcription software such as the kit from Olympus, you can move backwards and forwards through the file to check something you may have missed. The second listen is done while reading through the finished transcript. I’d suggest doing this after you’ve spell-checked it and added any names, checked spellings or defined acronyms, so you can concentrate on making sure you’ve got everything right. Add in any bits you’ve missed out or misheard. My audio typing tutor recommended printing the full transcript and comparing it to the onscreen version on a third listen, but I personally don’t find that necessary. In speech, people use hesitations and fillers while they think of what to say next and let their brain catch up with their mouths. Some people have a habit of saying ‘You know,’ or ‘for me’. These don’t add anything to the transcript and makes it harder for the reader to focus, so remove them. Likewise, I don’t think you need to include the ‘hello, how are yous’ at the beginning or the ‘thanks for coming/having me’ at the end. Readers will assume that this was done, especially if they visit your site regularly, and don’t need to see it in the transcript. A one-hour interview can produce 6,000+ words, so make sure each of those is worth including. People repeat themselves in speech all the time! They do this for emphasis, to give them to think about what to say next, or because they’ve forgotten what they were talking about. If you’ve captured it clearly and concisely once, you don’t need to include it another two or three times. Again, your podcast transcript needs to be clear and pleasant for the reader. And if they’re not listening to the audio at the same time, they won’t necessarily know that the person repeated themselves – they might just assume you made a mistake in the typing. The host or the guest might forget what they were saying, change their minds or decide to ask/answer the question in a different way. Pay attention to sentences tailing off without a logical conclusion while you’re doing the first listen and typing, and if possible see if the next sentence or point ties it up. If not, take the sentence out or cut it at the last place the speaker makes a point. There’s nothing worse than reading a really helpful piece of information and finding the key point missing from the end! And again, the reader may assume you’ve just forgotten to write it in. 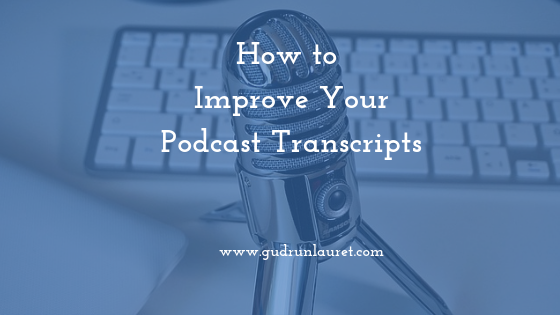 Make Sure Your Podcast Transcripts Make Sense! Go through the transcript and check it’s easy to read and understand. You might choose to do this with or without the audio. If it’s downloaded by someone who’s not that familiar with your show or your other content, will they be able to follow it? Have you explained or removed jargon, written acronyms out in full and included definitions of unfamiliar terms if you or the guest didn’t explain it properly during the conversation? You might want to ask someone else to read the transcript for you. Find someone who isn’t in your industry to look for any specific terms you’ve used, or a writer or editor friend who might be able to spot consistency and clarity errors. You may also be interested in: How to Get Started with Podcasts and Making the Most of Podcasts.